The US Dollar Index is up roughly 7.5% since it’s February lows, a move that has hit many of the global stock market ETFs we follow due to their local currency exposure. The Frontier Markets ETF $FM is among those hit hardest, down roughly 16% since late January. With that in mind, we like to focus on strength and there are three global ETFs that continue to hold up well and should lead if/when strength in the US Dollar subsides. One-Third Of the Year Is Over. Now What? Now that we’re officially a third of the way through 2015, I think it’s a good time to reflect on what we’ve seen so that we can get a better idea of where we might be headed. I’ve taken a little bit of time off from the blog as we held very high cash positions over the past few weeks, but I’m back and want to share some thoughts. As far as the major U.S. Averages go, I think structurally they all look fine and are still in strong bull markets. I find it tough to argue against that. From a more tactical perspective, these consolidations over the past few months look constructive to me and I would expect breakouts to new highs at some point soon. I won’t be loading up on Index ETFs or futures through; I think there are better opportunities within individual sectors. A year like this is very frustrating for the passive investor who owns the averages and doesn’t take advantage of the overwhelming dispersion we are seeing between stocks as sector rotation has ruled the land so far. Look at areas like Energy, base metals and emerging markets for example, that were left for dead, absolutely dominating recently (see here). One of the reasons we’ve held large cash positions the past few weeks is because a lot of our upside targets that we had coming into April were hit a lot quicker that we expected. It’s not a bad thing, but when targets are hit I think it’s important to back off. I still like this emerging, energy, base metal theme going forward, but I think it’s important to pick and choose our spots. The entries today are not as favorable as they were, say a month ago. I’m happy to see the U.S. Dollar get crushed the past 6 weeks. I’ve never seen such consensus bullish US Dollar sentiment. That was nuts (see here). The easy money has been made on the short side here, but I think this unwind continues. The US Dollar Index itself hit some very important upside targets in mid-March (see here), so I’d bet it’s going to take some time for this to unwind. I would not be buying US Dollars for anything other than just a very very short-term trade. I like the others, particularly Canadian Dollars, which I have liked since they broke out in Mid-April. But just like in the sectors mentioned before, the entry point today is no longer as favorable as it was last month. In the bond market, I am happy to see rates mean revert while bonds get hit hard. I’ve liked the Long Crude Oil / Short Treasury Bond trade and still think this mean reversion has legs (see here). The ratio in the USO/TLT pair, which allows you to express this trade using ETFs, is near 0.16 up 30% from the lows in March, but still a ways away from our 0.21 target. Bigger picture, I still think interest rates stay down. Economists continue to get this wrong and since they don’t actually put money to work, they keep making the same wrong call over and over again. Meanwhile, the fed fund futures market which has been dead on this whole time continues to point to low rates. They are currently pricing in just a 46% probability of a rate hike at the late October meeting. I’m still in the camp, like I have been, that they do nothing this year. Coal is an area that looks interesting down here. As these beat up sectors like Energy, Base Metals and Emerging Markets mean revert to the upside, Coal has participated a little bit but not as much as the others. I think we can see significant upside from some of these coal stocks. We’re paying close attention to this space entering the middle third of the year. The Agribusiness sector has really caught my eye. When you look at a sector ETF like $MOO which seeks to track to Market Vectors Global Agribusiness Index, it’s hard to find a nicer base out there. Look at this index on multiple timeframes and tell me that a breakout isn’t going to be extremely powerful. The only thing that has held me back is the flat 200 day and 200 week moving averages. If these smoothing mechanisms can start to slope up, we want to be all over this space, particularly from a structural perspective. This index is loaded up in agricultural stocks like John Deere, Agrium, Monstanto, Potash, etc. This sector has my attention. Globally, I’d say that a big theme is countries hitting our upside targets. When you look at China, Japan, Hong Kong, Philippines, Malaysia, Australia and Vietnam, they have already reached our objectives. So at this point, it’s hard to find good entries globally. I think a lot of easy money has been made around the world, so it’s hard to put new money to work here. I’d say one area we are looking at closely that has yet to take off on us is Taiwan. We’ll be watching these guys closely this month as their long-term smoothing mechanisms begin to slope up. Finally Natural Gas is an interesting area we want to watch. We are coming off bearish extremes in sentiment that we haven’t seen since 2002. Meanwhile, the Commercial Hedgers, who we consider to be “the smart money”, has the most net long exposure that we’ve ever seen. These factors accompanied by bullish momentum divergences on multiple timeframes point to a mean reversion here to around $3.40. With prices currently under $2.80, this risk/reward favors the bulls. We’re not in but will be looking for entry points in the coming weeks. That’s what’s going on in my head. What are you guys thinking here? October was a blast wasn’t it? I don’t think I’ve had this much fun in the market in years. I’m not really sure why. A lot of it probably has to do with the precious metals crashing. For some reason that always brings a smile to my face. I still think both Silver and Gold head lower and can’t see what would make me change my mind yet at this point. Our targets are still much lower (silver < 15 and Gold 1000). The US Stock market continues to prove why it’s the best in the world. Compare the S&P500 with any other market in the world and the ratio charts all go from the lower left to the upper right (SPY/anything). Same can be said for anything relative to Yen. The yen continues to get destroyed and this also really makes me smile. I don’t know why. I try and keep my emotions controlled but I can’t figure out why these two markets make me feel this way. From a risk management standpoint I think this month is a good example as to why you need to define your risk levels. When we broke support in a lot of averages a few weeks ago, I figured we’d keep dropping. I said if S&Ps get back above 1905, there was no reason to be bearish anymore. But truthfully I figured that was the lower probability outcome. I really did. But regardless, another reason why it’s so important to keep an open mind. From a seasonality perspective, we really have the perfect storm in equities. Our seasonal model could not be more bullish for the S&P500. It’s a combination of the one year seasonal cycle entering the best 3 month period of the year, the Presidential cycle just finished up its most bearish period and now entering one of the more bullish times, and the Decennial pattern is going into the best time of the decade, by far and away. Many people talk about the, “Sell in May and Go Away”, but few quote the, “Remember to Buy in November” side of it. This is all fascinating for me as a market nerd. The US Treasury bond market has to be one of the most interesting spaces on earth. Just think about this for a second. I keep hearing how the fed is manipulating interest rates or whatever. Maybe they are and maybe they aren’t. That’s not my problem. I just think it’s funny that the minute they said they’d be buying fewer bonds (a year ago), that’s twhen the bond market started to rally. If they were actually manipulating that market, wouldn’t it have been the opposite? Economists got the bond trade completely wrong this year. I enjoy using them as a contrarian indicator, particularly when they are at a consensus. Coming into the year 67 of 67 Wall Street economists polled said rates were heading higher in 2014. When in fact, it was actually one of the biggest collapses in rates in American history, from a percentage change basis. Love that. The agricultural commodities continue to mean revert. I’m hearing rumors from friends that it may have something to do with Soybean Meal futures getting squeezed and spilling over elsewhere. I’m not sure of the reason, but fun to think about either way. Corn, wheat and beans keep ripping and I don’t hear anyone really talking about it. From a sentiment standpoint these guys could not have been more hated a month ago. We are seeing similar extreme bearish sentiment in the energy commodities. Unleaded Gas and Heating Oil specifically haven’t seen this much pessimism since 2002. Nuts. I think we could see a similar mean reversion take place there soon, like we’re seeing in Ags. Extreme sentiment unwinds create incredible moves so I’m really looking forward to that. The currency markets are going bananas. Everyone loves the US Dollar now all of a sudden. In May, they thought it was going to crash. I think the Euro is about to get a nice squeeze. The perfect entry point in my opinion would be a rollover down around 124 where we broke out from in the summer of 2012 when the euro was being dubbed, “an experimental currency” and then proceeded to explode higher over the next 6 months. We could see something similar develop soon back up towards 133. In currency land, that’s a huge move. We’ll be patient and wait for the setup, but I think it’s coming. A breakout back above the 2013 would be great confirmation that the sentiment is starting to unwind. But the big story recently is absolutely the Yen. As terrible as this currency has been over the last few years, we are entering a whole new level of terribleness. We absolutely love this market, specifically anything with the Yen as the denominator. The EURJPY broke out above its 2014 downtrend, GBPJPY put in new weekly closing highs not seen since 2008, AUDJPY is now back above the summer resistance and looks great, and even against the US Dollar USDJPY broke through monster resistance that was both the 2008 highs as well as the 161.8% Fibonacci extension from last summer’s correction. I love everything about what we saw this week in Yen. Looks to me like this is going a lot lower against other currencies and the targets are very far from current levels. You guys know that I’ve hated metals more than anything, but now I think Yen takes the cake as my favorite thing to hate. My buddy Phil Pearlman from Yahoo Finance asked me at Stocktoberfest what my big idea was for 2015. I didn’t know how to answer that. I’m like, “Phil really? 2015? I don’t know what I’m having for dinner tonight and you’re asking me about 2015?”. Then he told me to think about it and get back to him. So I did. After I decided to have sushi that night. I think the biggest thing for next year is the fact that rates will stay down. Fed Fund futures are still pricing in low rates for the foreseeable future. I rather trust the market which is forward looking, rather than the economists who are backward looking. I’m in the camp that economists get it wrong again. The way I see it, sure rates will “eventually” go up. Duh. But it’s the when that matters. I don’t know why everyone is in such a hurry. We know that bonds will one day be in a multi-decade bear market. But since we know this, what’s the rush? Just wait. There will be plenty of time to profit from it. Look at how long it took rates to bottom from the 1930s through 1950s before they eventually stayed up. Why the rush? Be easy. Sector-wise, healthcare is just a beast. There is nothing out there that has done this well for this long. It’s fascinating watching these guys continue to dominate. There isn’t a single sector or sub-sector in the United States currently exceeding a 2.618 extension of the 2007-2009 decline. Nothing is even close in fact. Utilities also continue to explode as money searches for yield. You’re not getting the fixed income you want out of the bond market, so money keeps flowing into the Utes. Love that. I’m not sure how this flight towards yield in stocks and higher bond prices aren’t here to stay. I was very impressed this week at how well the bond market held up in the face of equities ripping and yen getting destroyed. I would have thought with moves like this, bonds would have taken a beating. They didn’t budge. I don’t hear many talking about this. I think to be short the United States makes little sense. If you’re going to be short equities, to express that using the strongest in the world seems counterproductive. I continue to hate the emerging markets, particularly on a relative basis. There isn’t anything worse on earth than Latin America. These things are a mess: Brazil, Chile, Peru, etc. Mexico is the one stand out from the group that isn’t horrible. I’d put Mexico in the group with Hong Kong as the “least bad” countries out there compared to the US. But when you have to make a face as you say that, how great can they be? Europe, meanwhile, is still a hot mess. The underperformance out of that space is hilarious to me. Just when everyone finally wanted to expose themselves to Europe, all their banks crashed bringing down the stock markets with them. Love that. The S&P500 continues to break out and make new highs relative to the EuroStoxx50. That ratio chart in particular is one of the nicer trends globally. Throw that in there with the SPY/EEM ratio chart that is also making new highs as emerging markets keep struggling. Those are two of my favorite charts in the world. I like how AAPL is making new highs. The fact that we were able to consolidate up there above the 2012 highs and then break out is a huge development. I would have preferred that it broke down because the reward on a crash would have been so much better than a resumed uptrend. But we’ll take what the market gives us and go from there. I think this AAPL breakout and yen crash are two good things for US Stocks. I don’t know where the major US Stock Market Averages are going, but I do know that I continue to love the US relative to anything else. The one thing that I absolutely know for sure is that I don’t know what’s going to happen next. I never have and I never will. So the only thing we can keep doing is to try and manage risk. Have opinions, set parameters, and adjust those opinions when the data suggests so. That’s all we can ask of ourselves. This might be one of my favorite long-term charts around the globe. Today we’re looking at Hong Kong, specifically the MSCI Hong Kong Index. iShares has a liquid ETF – $EWH which makes it nice and convenient for us to participate if we want to. So here’s why I’m interested. The weekly chart is trying to break out above multi-year resistance levels. The question now is whether or not it can hold this breakout and shoot for those 2007 highs that are still almost 20% away. The risk we’re taking is that this breakout doesn’t hold and it rolls back over below all of that supply. But I suppose that’s always the risk on a breakout play right? The difference here is that resistance levels are rarely this clean. In the case of Hong Kong, we want to see the 20 and change level hold for us to continue to be interested in the space. To the upside, we’re targeting those 2007 highs above 24. 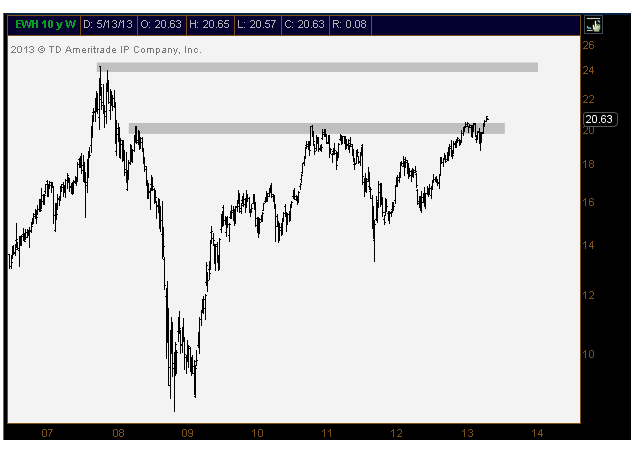 For you guys that prefer dividend-adjusted charts, $EWH is already sitting at all-time highs. Either way, we find this name attractive and it definitely has my attention.